We will show you the use of the filter function for the Offer window in the "Situation as before / Previous match: same opponent". This feature allows you to get a match of matches (winnings / ties / losses) in previous team matches that followed a match with the same opponent the team played in the previous match before the match being played. So, for example, how the team played the next match in the past if, as now, the match was preceded by a match with the same opponent. 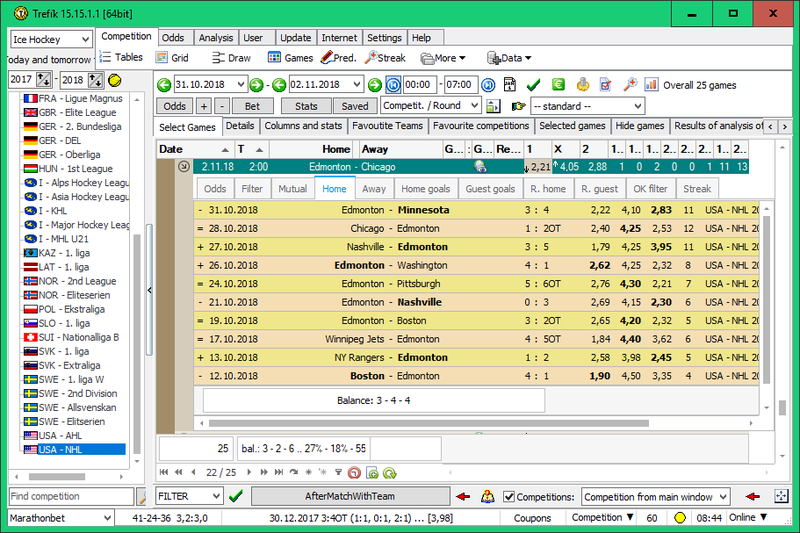 For this function, it is possible to set only to count the matches from the matches that the team plays equally at home / outside the current match. Also, it may be required to seek only matches with the previous opponent that were played as well at home / outside as the currently previous match. It is also possible to make sure that previous matches result in the same result (win / tie / losing) as the previous match. And it is also possible to limit the odds to a team in the matches from which the balance is calculated. The odds limitation is taken in relation to the odds of the team in the current match with respect to the given deviation of the odds. .. "1-Opponent" means for the home team (number 1) the previous match (the minus sign) with the same opponent and gives the balance of the next match .. separately the wins (+), ties (=) and loses (-) are shown. The "2-Opponent" entries contain the corresponding values for the visiting team (number 2). Items with a # character indicate the ranking of the previous opponent (at the time of that previous match). As for the cups, respectively, play-off competition, the number 0 is displayed. .. therefore the previous opponent for Edmonton was Minnesota. 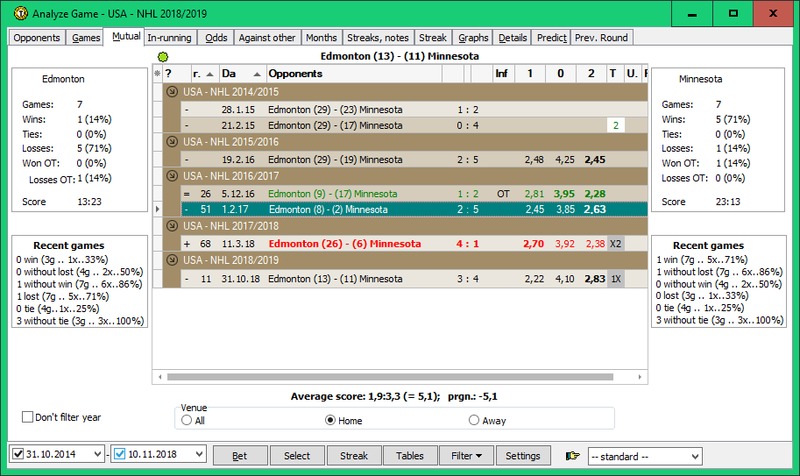 The balance for Edmonton is therefore calculated only from home matches following the home LOST duel with Minnesota. .. we've been looking for all lost Edmonton matches in the last 48 months. There are 4 such matches shown in the previous picture (not counting the last one as that is the currently previous match and we need to calculate the statistics for the past matches). Now we have to check what Edmonton played at home (if played away, we ignore these matches due to the filter settings) the next match. In the GAMES section we find out that these are the following: 30.01.2015 .. WIN, 22.2.2015 .. LOST, 21.2.2016 LOST. So we get a balance of 1 - 0 - 2, which corresponds to the statistics displayed in the Offer window. Similar statistics are also available to guests. We can furthermore compare these stats or filter the matches using these data. 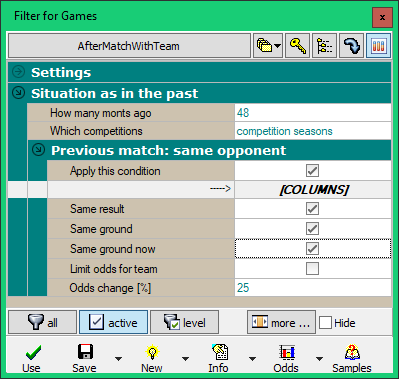 The "Situation as in the past / Following Match: Same Opponents" filter section works similarly as described above. It counts a match from matches played before matches with an opponent who is currently waiting in the next match. The difference in the filter setting for the next match is that it is not possible to apply a condition for the same result of a match, which is not yet known before the current match is played.